RT 06 Drughi Pundong Sector. Powered by Blogger. Thank You, Visit Jogja soon Jogja,More than Words ! Previously, my brother is a big fan of food that one is, every time my mother would always ask for memesak sister cooked Brongkos complete with occupants of Boiled Egg and chicken pieces, or it could be a young cow bone. Brongkos is the cuisine of Yogyakarta's most rarely wander into areas outside their home. At first glance like rawon (East Javanese food), but the sauce is thicker because it is cooked with coconut milk, and the spices were more complete. The presence of Tolo beans and tofu in this dish makes it even more different from rawon. In my opinion, including foods that are easy brongkos preferred. First, because it makes it feel fresh berkuah cuisine, especially in the often sweltering tropical nature. 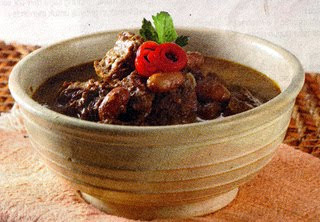 Second, because it consisted of beef, beans Tolo, and know that it is a popular food ingredients like people. In Yogyakarta and its surroundings can be found some excellent sellers brongkos each has his trademark. One of the legendary is Brongkos Bu Padmo under Krasak Bridge, about 30 minutes in the Northern town - on the track-Muntilan Yogyakarta. Interestingly, even though this place is officially called Warung Ijo, but more people know him as Warung Bu Padmo. Bu Brongkos Padmo intense taste, with coconut milk mlekoh. The meat is tender, and served in generous portions - both beef and beans Tolo her. Nuts Tolo was also very tender, with an absorbed perfect seasoning. In the city of Yogyakarta, in the South Square area of ​​Yogyakarta, there Warung Pecel brongkos Handayani who also had a classy champion. The specialty here is wearing brongkos sprinkles mlinjo chips. There is also Brongkos Koyor Kotik (from Koh Tik) in Gandekan Road, near Malioboro. As the name implies, slices of meat koyornya big ones. Special, brongkosnya wear mlinjo rind. Tent stall is only open at night. Use koyor in Brongkos Kotik seems to inspire some sellers brongkos to add kikil in her cooking. Lately, because of somewhat reluctant to get out of town, I find at Warung Soto brongkos Ngasem which was subscribed lane X and Probosutedjo. The reason I liked this brongkos mainly is because the broth was more dilute, not how bersantan. Sometimes there is also a poached egg entering into brongkos cuisine. Eggs are becoming increasingly crowded as the old boiled - boiled eggs are similar - and absorb the marinade is tasty, making this dish even more special. Suitable companion for brongkos is salted egg and crackers skin. A sprinkling of crispy fried onion flavor brongkos will also increase.